When Robert Armetta showed his new alla prima landscape paintings at Hersh Fine Art in 2016, it was a slight departure from the meticulous and highly polished compositions of his studio paintings. In addition to new landscapes, “Notations: Recent Paintings” brings the same spontaneity and delight into still life subjects that he has been infusing into his urban and rural landscapes. Working in the open air (plein air) forces the painter to make confident decisions, moving quickly across the canvas or paper to capture transient moments as the light changes and the wind blows. In contrast, still life is a highly controlled studio set-up that often can come across as flat and stiff. 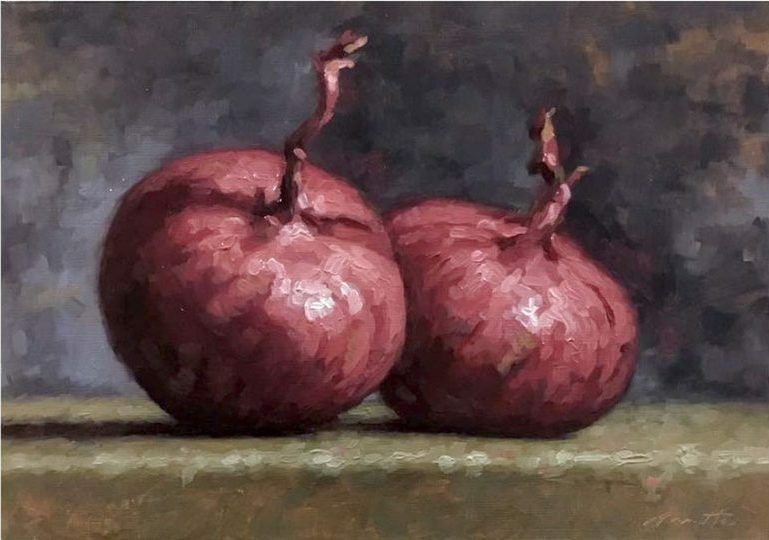 Robert, however, paints his still life subjects in such a way that they bring the same vibrancy and freshness that he does to his landscapes, working the surface of an onion in the same manner that he would the leaves of a tree. The objects are far from feeling “still,” and they most certainly have life. Rosenblum and Kadish have mastery of an indirect process. They arrive at their work, not through direct visualization of what the outcome will definitely be, but through a skillful manipulation of an uncertain process. In the dyeing of fabric and the fire of the kiln, there is a mysterious alchemy that occurs that cannot be entirely controlled. Kadish and Rosenblum are the directors of processes that are rooted in tradition, but break away into inventive, unchartered territory, with exciting results. From a family of fashion designers, Susan Kadish’s life has been rooted in aesthetics. 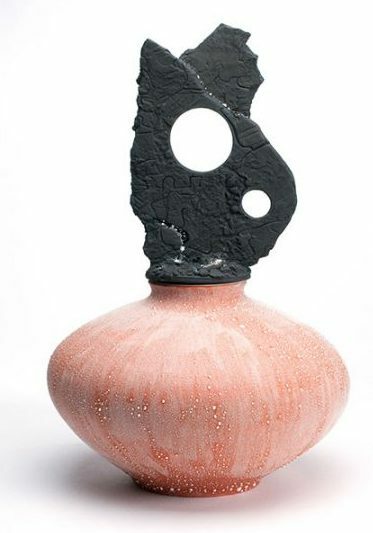 She is particularly inspired by East Asian techniques and says, “I have challenged myself with such thousand-year-old pottery methods as hand-building and raku. I have worked with multiple firing, gunpowder and pit firing for different surface effects and properties. There is an allure to pairing ancient techniques with modern and experimental firing.” Kadish has spent nearly a decade perfecting, and subsequently patenting, a process using liquid silver to embellish the surface of her ceramic sculptures. “Each piece is jeweled with thousands of droplets of iridescent silver that shimmer like beads of morning dew on grass. In the firing process the droplets literally bubble through to the surface, dancing atop the under glaze, capturing and refracting the full spectrum of light,” she says. Rosenblum’s early love of quilting began with traditional designs, and she began dyeing her own fabric with fiber reactive dyes, silk screen and shibori techniques. This gained her notoriety in the field of quilting, but studying classical drawing and painting made a deep impact on her work. In a discussion on fiber dyeing as a painting medium, she says, “I am nudged into handling the brush in a very painterly way, navigating the cloth the way the Impressionists handled landscape.” The synergy of paint, dyes, textiles, and yarn interwoven into Rosenblum’s work also offers an original interpretation of her subject matter. Using inspiration such as flowers, trees, and other garden motifs, organic materials translate other organic materials, forming a union between the craft and the image depicted. 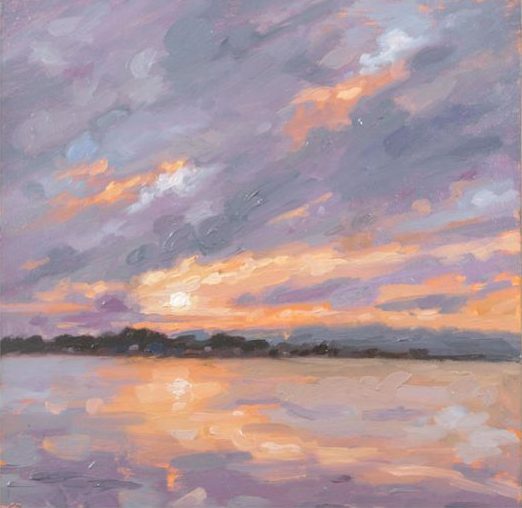 Dr. van de Stouwe began formal classical training in earnest in 2002, studying at the Stevenson Academy and then the Long Island Academy of Fine Art in Glen Cove, but her journey began when she purchased her first oil painting set in the 8th grade. Her strengths in science and math took her on a different career path, however, and she graduated medical school with a specialty in Rheumatology. Dr. van de Stouwe has continued a serious pursuit of painting while maintaining a thriving rheumatology practice and raising three daughters, taking workshops and classes on a regular basis in addition to private lessons with Michael Klein and others. 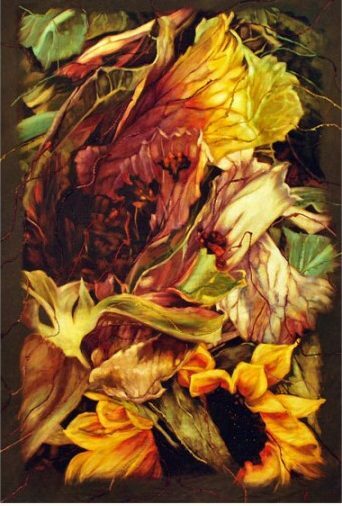 In 2014 she brought her years of private training to the public eye and began exhibiting and winning awards in numerous juried shows across the United States, including exhibitions for Oil Painters of America and American Women Artists. Awakenings is her first solo exhibition. Dr. Van de Stouwe currently lives and paints in her home studio in Upper Brookville, Long Island. Saluja is a classically trained artist whose work has been exhibited at the Royal Ontario Museum in Toronto and the Reach Gallery Museum in British Columbia. While her past works were traditional, iconic, historical portraits of Indian Maharajahs, Saluja is exploring contemporary themes from a personal perspective and finding aesthetic inspiration in people and objects that do not typically warrant attention. Saluja’s current work depicts fleeting moments from her commute to and from Manhattan. The oil paintings are about the claustrophobic crowds, corroded steel and soiled walls she encounters each day in New York City’s underground subway. Rather than make the work feel as forlorn, she chooses to paint the beauty and resilience she sees in these ordinary moments and objects with visual excitement. The work ranges from portraits to combinations of abstraction and realism. Saluja employs a variety of dynamic brushwork, from loose, chromatic drips and thick strokes to subdued and refined expressions of light over form. Some of her work, such as Red I, and Green I lean more towards the abstract. 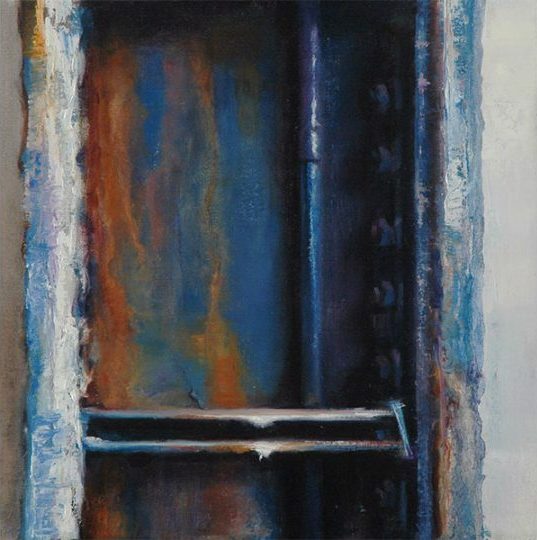 At first glance one is struck by a kaleidoscope of color and complex textures and, at closer view, sees that they are looking at torn layers of oxidized, rusted paint on steel girders. In work such as Transfer, Saluja paints light as it flows over soiled, cracked walls to reveal subtle hues and dramatic shadows with the same grace it would a garden or Cathedral. Passage I is set to join the group exhibition titled “Women Painting Women: In Earnest.” The traveling exhibition will start at the J. Wayne Stark Galleries at Texas A&M University in January 2017. The artist’s hope is that the paintings can serve as metaphors for strength amidst challenge. Painting a landscape from life– life that moves and changes–is entirely different from painting in a studio. The painter must keep up with the changes of the landscape itself, requiring one quick, confident decision after another throughout the painting’s creation. Because plein air painting involves a certain speed and decisive execution, it gives a glimpse into the artist’s unique creative process. What we see is Armetta’s instinct as a composer of art. His compositional decisions, color choices, and paint handling are in many ways a summation of his direct experience painting in the open air. Like a distant mountain clouded in violet atmosphere, the conscious mind fades as intuition comes to the foreground. Stephen Bauman’s portraits center on the emotional inner life of his subjects. Through his mastery of drawing media, he aims to capture the human spirit as it passes from one experience to another. The drawings are an homage to the craft itself, offering an observable dialog between the artist’s mind and hand as we see clearly defined planar shifts, cross-hatching, and erasure marks. This exhibition reunites three graduates of the Florence Academy of Art in Florence, Italy. Studying together over 10 years ago at this prestigious institution, each artist brings his and her own unique vision and experience in this show. Hernes and Bauman currently reside in Sweden as principle instructors at the Gothenburg branch of the Florence Academy of Art. Forster, a resident of Glen Cove, is director of the Long Island Academy of Fine Art, where he also teaches. 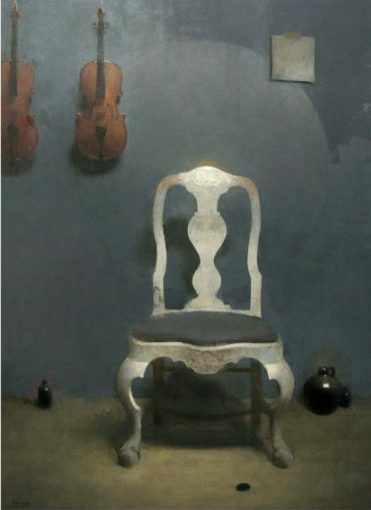 Cornelia Hernes’ stilllife paintings are a clear and transformative view of the objects one holds and touches. In an age of speed and efficiency, Hernes asks the viewer to pause and observe the things with which she interacts and to consider the beauty to be found there. Rarely is such a love and care for unique objects so finely reproduced in oil paint, but more distinctly, it is unusual to see still life paintings that capture life and time within their quiet, self contained spaces. 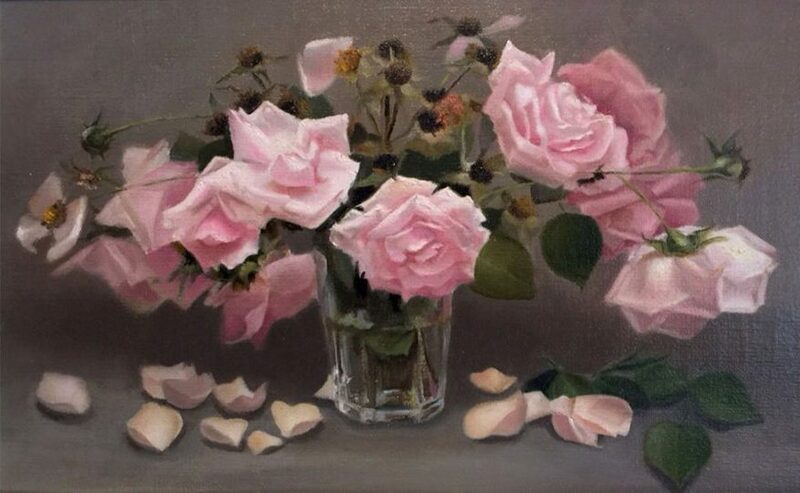 Rather than stopping time and preserving her subjects in a single stiff moment, the viewer sees the slow passing of the minutes; the roses seem to shift as gravity slowly pulls them down, and their petals seem to loosen. The incense fades and reappears with the subtle currents of the air. Stephen Bauman melds form and atmosphere to illuminate the connection between the physical and spiritual. His respect for life and the human form are easily seen in his figurative work, and his drawings are an homage to the craft itself, offering an observable dialog between the artist’s mind and han d. Bauman’s watercolors show a spontaneity and immediacy that is distinct from his drawings and oil paintings, whereas the oil paintings show the controlled and articulate execution of sophisticated emotion. In his series of landscape paintings, Steve Forster brings together a poetic vision of Long Island that draws from a Romantic tenor and sense of story. Deliberately and imaginatively composed, the paintings may be more accurately described as narratives than landscape renderings. 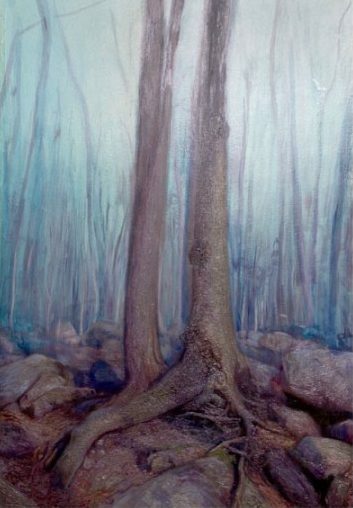 The trees take on humanlike gesture and form; posed in an interplay with each other, the light, and surrounding elements, they suggest an underlying story that may not immediately be perceived. As a director carefully places actors on a stage for visual impact and nonverbal storytelling, Forster uses depth and atmosphere to establish relationships and mood within his narrative landscapes. Combining a fine art aesthetic with fiber art as a medium, Lauren Rosenblum’s fiber paintings elevate what would typically be considered craft to a fine art status. Hersh Fine Art’s upcoming exhibit pays homage to a career that cannot be defined with one word, as the work represented brings into unity the many facets of Ms. Rosenblum’s creative talents and interests. As a master painter, textile designer, muralist and quilter, she deftly and skillfully transitions between each part of herself, defying categorization and drawing from all aspects of her varied background. Ms. Rosenblum’s experience as a muralist and figurative painter informs her use of color, allowing her to paint images that are simultaneously rich and subtle, much the same way that Edward Steichen’s monochrome photographs give an illusion of resplendent color. The synergy of paint, dyes, textiles, and yarn interwoven into the fiber paintings offers an original interpretation of her subject matter. Using inspiration such as flowers, trees, and other garden motifs, organic materials translate other organic materials, forming a union between the craft and the image depicted. Ms. Rosenblum’s early love of quilting began with traditional designs and she quickly began dyeing her own fabric with fiber reactive dyes, silk screen and shibori techniques. This gained her notoriety in the field of quilting. She continues developing techniques, dyeing the fabric and removing the color for painterly effects. Studying classical drawing and painting has made a deep impact on her work. She navigates the cloth the way the Impressionists handled landscape–with movement, strokes, rhythm, harmony and a sense of texture. Residing on Long Island, New York, Ms. Rosenblum is currently an art instructor at the Long Island Academy of Fine Art, along with running her business Lauren Rosenblum Decorative Designs. She has studied at FIT, Art Students League, Stevenson Academy of Art and Long Island Academy of Art. For Mark Opirhory, landscape painting is a physical, even tactile, record of things felt and seen in the natural world. Thick, colorful layers of paint imitate the natural forms of roots and limbs, almost as sculptural and textural as the actual thing. Far beyond being a photographic history of a specific place, there is captured simultaneously the raw mystery of nature, and an autobiographical element that is at times lovely, at times unsettling. The paintings fluctuate in meaning from a natural rendering, to memory of time passed, to metaphors for how human beings coexist. Mark Opirhory was born in New Jersey. 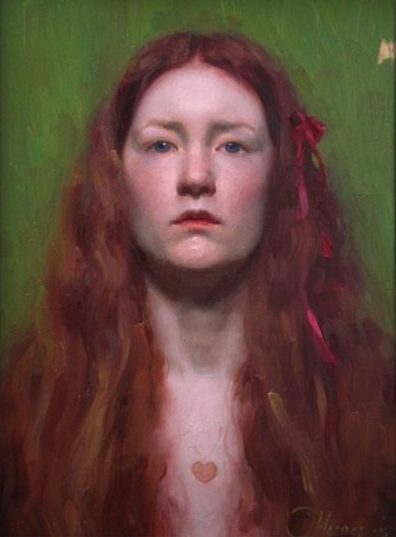 He studied at the School of Visual Arts in New York City and received his MFA from the New York Academy of Art (NYAA). He currently resides in Brooklyn, NY, and teaches color theory at NYAA.